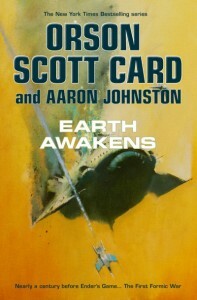 Chronologically, ‘Earth Awakens’ is the third book in the First Formic War Trilogy. Nearly 100 years before the events of Orson Scott Card’s bestselling novel ‘Ender’s Game’, humans were just beginning to step off Earth and out into the Solar System. A thin web of ships in both asteroid belts; a few stations; a corporate settlement on Luna. No one had seen any sign of other space-faring races; everyone expected that First Contact, if it came, would happen in the future, in the empty reaches between the stars. Then a young navigator on a distant mining ship saw something moving too fast, heading directly for our sun.